Nollywood actress, Abiola Adebayo, popularly known as Biola Eyin Oka, has every reason to be grateful at the moment. 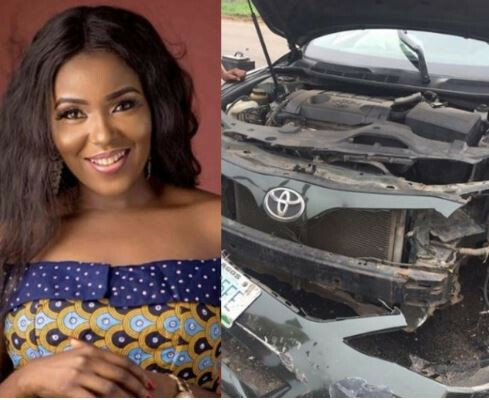 The talented role interpreter on Sunday took to her Instagram page to share pictures from the scene of an accident she survived. Adebayo who survived with only minor injuries wrote: ”I survived it. I return all the glory to God! I’m hale and hearty and back to work. God bless you all. Just keep praying for me”. The versatile actor started her acting career with Wale Adenuga Productions. Since then she has starred in countless movies and making impact in Nollywood.